How long have you been with the department? What is your current title at PennDOT? What do you consider your greatest accomplishment at PennDOT? In 2017, I earned my Professional Engineer license. The experience I gained through PennDOT prepared me for this exam, and I look forward to seeing how this accomplishment will help me contribute to PennDOT in the future. What has surprised you most about working for the department? 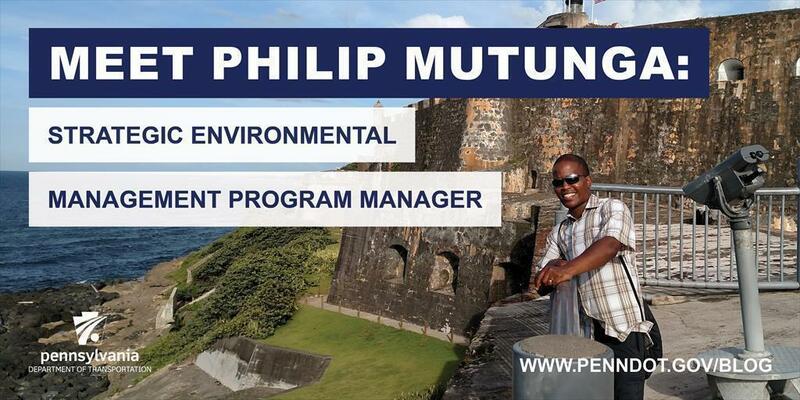 When I first came to PennDOT, I was surprised by the vast range of opportunities within the department. I began my career working in the traffic signals unit, and now I'm working in maintenance — a completely different field within PennDOT. I was surprised to learn that PennDOT even has a Bureau of Aviation! What is something you wish the general public knew about the department? PennDOT invests an enormous amount of time, money, and thought into upgrading infrastructure throughout the Commonwealth. This job is constant, and PennDOT employees work hard to deliver quality work to the citizens of PA. I wish more of the general public was aware of these efforts. What do you do when you aren't working? I love to travel and meet people from different cultures. In Pittsburgh, I enjoy watching live theater, trying out new restaurants, and attending festivals. I am a political news junkie and an aviation fanatic. When I'm not at work, I'm often following the political scene, attending airshows, and learning everything I can about airplanes. What might someone be surprised to know about you? My two brothers and I are identical triplets. You were recently featured in Minority Engineer Magazine. How do you feel about the experience and being recognized as someone who other engineers can admire? I was honored that Minority Engineer Magazine wanted to share my career experiences with their readers. I appreciate the magazine's efforts to recruit and inspire young minority engineers, and I'm glad I could be a part of their mission. Is there any advice you would share with a child considering the field of engineer as a career? Join engineering clubs or after-school programs, so you can learn what this field is all about and develop your skills. There are so many different types of engineering; go job shadowing and do lots of research to find out what type of engineering might be a good fit for you. Work hard and do your best in all your classes — especially math class! Did you know PennDOT is directly responsible for nearly 40,000 miles of highway and roughly 25,000 bridges? We oversee programs and policies affecting highways, urban and rural public transportation, airports, railroads, ports and waterways, in addition to administering the state's more than 11 million vehicle registrations and 8.8 million driver's licenses.